I don’t have a bucket list, in part because I’m fairly easy to please, at least on a day-to-day basis. 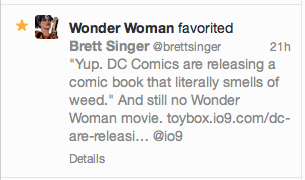 Today I’m happy because Wonder Woman favorited my tweet. 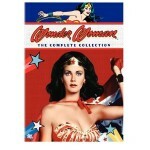 Now, by “Wonder Woman” I mean whoever runs the Twitter account @LassoingGoddess. Still, I’m happy. Happier than Pharrell Williams? Maybe relatively, but the video for his song “Happy” has over 445 million views, and he’s currently enjoying a career better than anyone in show business. So my guess is that he’s happier than me. At least I hope he is, because he’s got a lot to be happy about. By the way, did you know he wrote a song about being happy? Ultimately it’s all about perspective. I’m not writing a hit song anytime soon, nor am I being asked to be a judge on a TV singing contest. But hey, Wonder Woman favorited my tweet. I’ll take it.